Last week I had to build a couple of Nested VSAN environments for testing and of course I used my VSAN Nested ESXi OVF template to help expedite the deployment. After deploying the OVF for the third time to get my three Nested ESXi nodes, it hit me. Why am I doing this each time when I know I will need a minimum of three nodes for a proper VSAN environment? Not sure why I did not think of this earlier, but why not create a vApp that contains three Nested ESXi VM templates? The only difference with these OVF templates is that you can now easily an quickly deploy a single OVF that will contain the minimal number of VSAN nodes up to the maximum supported which is 32. To deploy either the single VSAN Nested ESXi OVF template or these new ones, you need to make sure you deploy using the vSphere Web Client. The reason for this is that the lossless OVF import/export feature is only available when using the vSphere Web Client, else you the import will not capture all the settings the OVF template was configured with. 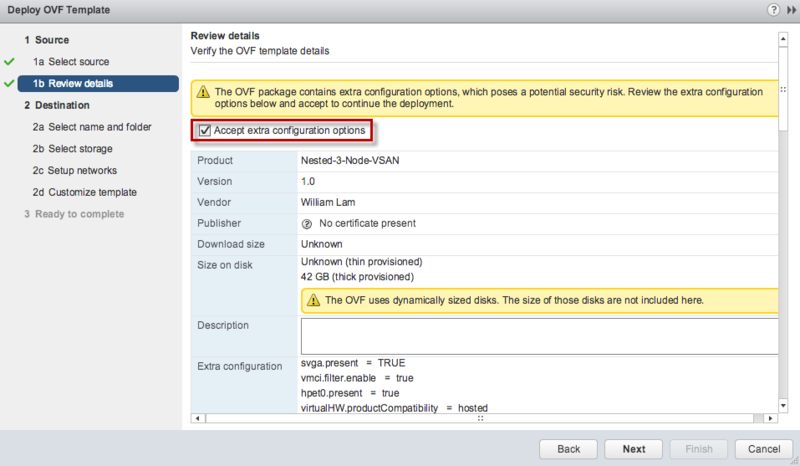 Step 1 - Deploy the OVF template using the vSphere Web Client and make sure you select "Accept extra configuration options" which contains extra parameters needed to run ESXi and VSAN in a nested environment. Step 2 - Go through the OVF deployment wizard as you normally would. When you get to "Customize Template" you will notice each Nested ESXi VM is in its own Category as seen in the screenshot below. Here you can leave the defaults for a minimal VSAN deployment which contains 2GB disk for ESXi installation, 4GB disk for an "emulated" SSD and 8GB disk for MD or you can specify the size for each disk. In just a couple of seconds, you will now have a vApp that contains either a 3-node Nested ESXi VM or you can go big and deploy a 32-node Nested ESXi environment. Note: Please note there maybe other configurations changes such as this one and/or increase in VM resources to run larger VSAN Clusters. I know these OVF templates will come in handy for myself when needing to quickly deploy a VSAN running in a Nested ESXi environment and hopefully it will also benefit others in the community as well! 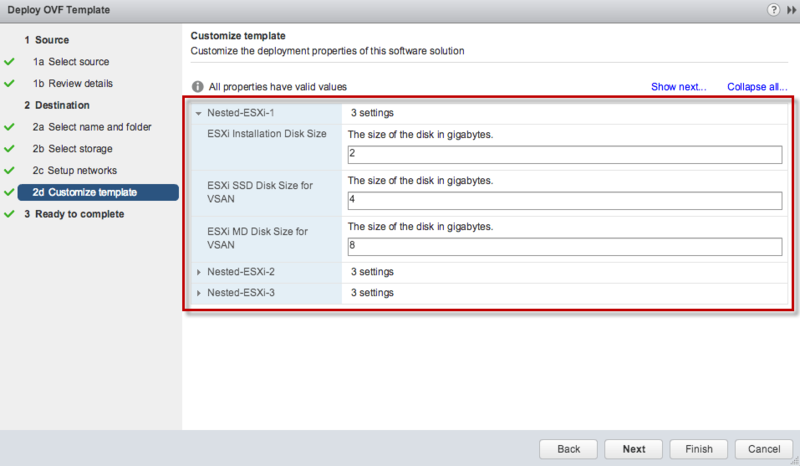 How to run Nested ESXi on the vCloud Hybrid Service? Is it just me or are others unable to download these images? I’ve tried both IE and Chrome. What gives? Getting this Error also. A connection error occurred. 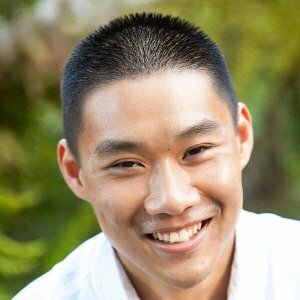 Verify that your computer can connect to vCenter Server when deploying OVF. Looks like S3 doesn’t keep the permissions when you over-write the file. I’ve just made the file public, let me know if you have any issues. This is great William! I really appreciate it and a huge time saver! When on option 2b (select a resource), it hangs on validating. I have updated the VCSA and am still having the problem. Any ideas? Never mind on this. I figured it out. I was in a rush and forgot to add my main host to the cluster 🙁 It is working fine now. all these templates running on esxi 5.5 but i have some issuses about vsan network all three nested esxi servers vsan interface cant connect each others.it is not just only about vsan network managemetn and others but i cant solve it. which case do i have to consider ? This was a HUGE help around testing with a customer. Thanks so much!